Finely detailed model of the Mirage F.1C/C-200 comes on six styrene sprues and one with clear parts. The Mirage F.1C came about as a private venture by the French Dassault company while it had been engaged in a project designed to fulfil the future needs of the French Air Force (Armée de l´Air) for a modern jet aircraft capable of carrying out interception and tactical attack roles carrying conventional or nuclear armament. A variety of designs were put forward in order to replace the outstanding Mirage III family which were currently filling this role and these were originally designed the Mirage IIIT, Mirage IIIF, Mirage G and Mirage G8. The Armée de l´Air chose the most promising of these designs which was the Mirage G8 with a variable-sweep wing but as the military expected a prolonged development of this advanced (for the day) technology they also decided to go ahead with the simpler Mirage IIIF which could enter service sooner and help bridge the gap before the new G8A could be finished. Two prototypes of the IIIF designated F.2 and F.3 were ordered and these were to be powered by a JTF10 engine. On top of these government contracts Dassault also decided to go ahead with their own simpler private venture design which featured a smaller airframe powered by an Atar 9K power plant. The first flight of the Mirage F.1 took place on 23rd December 1966 and production aircraft entered service with the Armée de l´Air as the F.1C single-seater fighter and F.1B two-seater trainer versions. During their service with France a number of these aircraft were upgraded by fitting of IFR probes which resulted in the designation F-1C-200. The Armée de l´Air also flew dedicated reconnaissance and a ground-attack versions of the MirageF.1 designated respectively as the F.1CR and CT, the latter being converted from the earlier F.1-200 airframes. A total of 246 Mirage F.1`s of all versions served with the French and Dassault also tried to offer the aircraft as the F.1E (E for European) version with a more powerful engine to Belgium, Denmark, the Netherlands and Norway as a replacement for their F-104 Starfighter`s but these countries chose the F-16 Fighting Falcon instead and the F.1E remained only as a prototype. Nevertheless two other European NATO members did fly the Mirage F.1 with Greece and Spain ordering the type and it was also exported successfully further afield. In South America Mirage F.1`s were ordered by Ecuador (F.1JA and JE two seaters) for the Fuerza Aerea Ecuatoriana while in Africa and Asia the Mirage F.1 proved especially popular, serving with the air forces of Gabon, South Africa, Morocco, Libya, Iran, Iraq, Jordan, Qatar and Kuwait. Flying with these air forces this variant of the famous Mirage family saw combat action the world, including mock dogfights over the Aegean between Greek F.1`s and Turkish fighters, French aircraft saw action over Chad, Libya, Afghanistan, Mali, Ivory Coast and even stood up against Iraqi Mirage F.1`s during the 1st Gulf War, Ecuadorian F.1`s were used in cross border skirmishes with Peru and South African Mirages also saw extensive action as a ground attack aircraft and fighter during the long Border War with Angola and Mozambique, often coming up against Cuban flown Soviet Mig 17, 21 and 23 jet fighters. Libyan F.1`s alo saw brief action during the Civil War of 2011 when several of them defecting to Malta. Although it is now quite an old aircraft the Mirage F.1 still sees frontline service with several countries including Libya which is bolstering its remaining fleet by buying some additional ex French aircraft, Gabon has bought six ex South African F.1AZ aircraft and Iran is believed to still fly some of the 24 ex Iraqi Mirage F.1BQ and EQ`s which defected here during the Gulf War. 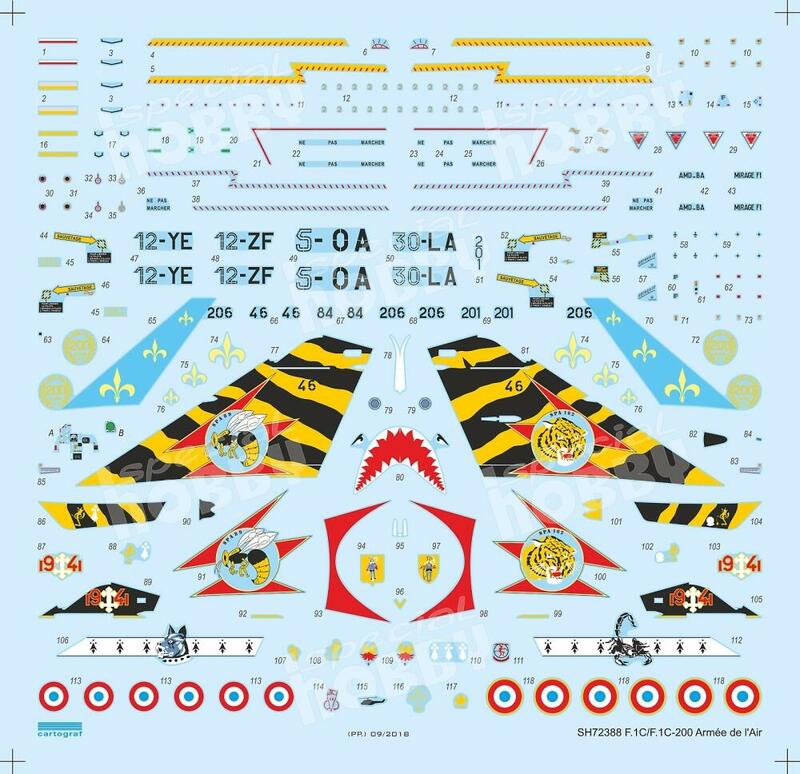 Finely detailed model of the Mirage F.1C/C-200 comes on six styrene sprues and one with clear parts. 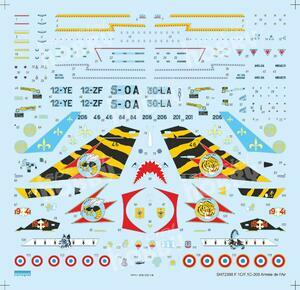 The decal sheet offers markings for two French F.1C machines and two more of the later C-200 version witch were equipped with the in-flight refuelling boom. Three of them are greyish blue on the upper surface with silver painted undersurfaces and feature colourful markings of their respective fighter units. The fourth machine, operated over African Djibouti, sports a desert camouflage scheme and carries, along its underwing armament, also a centreline fuel tank with a shark mouth and eyes.